A macaque monkey named Michai has lost a finger after an explosive interaction with a human. It began when one man decided to abuse Michai's trust. He offered a small snack bag to Michai, but instead of food, there was a firecracker inside, according to The Independent. Reports about Michai's current status vary, but this incident has prompted outrage online. Although people are calling for justice, the identity of the pranksters is also unknown, according to The Mirror (U.K.). A video of the incident, first posted anonymously in 2014, shows a monkey sitting on a wall and asking for food. 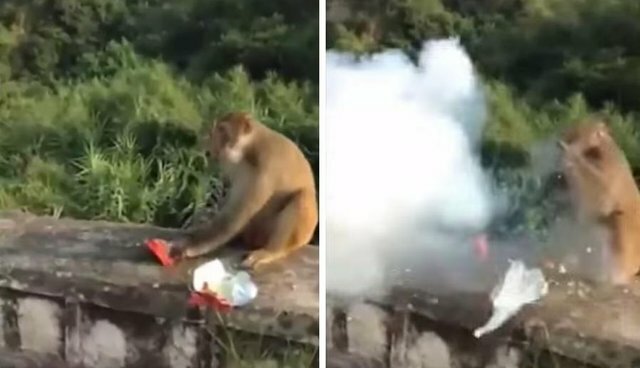 A person off-camera throws what seems to be a bag of chips toward the monkey, but then it becomes clear this bag was no harmless gift. This footage captures an act of violence that is not only unnecessary, but also exceptionally cruel and unusual.